Jewels of the Trade is a rich sapphire blue with the Mega Flame finish. This is sooo sparkly! It's top coat hungry so you'll probably want to be generous. Shown is two coats plus top coat. Deck the Claws is a bright red with the Mega Flame finish. It's also top coat hungry so you'll probably want to be generous. Shown is two coats plus top coat. Fir Sure is a medium green linear holographic. Shown is two coats, no top coat. Come On Get App-y is a blurple linear holo. Shown is two coats, no top coat. You’re Brew-tiful is a pale golden brown linear holographic. Shown is two coats plus top coat. Why So Sirius is a rich navy with shimmer that shifts from teal to purple, with holo glow flakes. Shown is two coats, no top coat. Up To Snow Good is a pale gray with subtle blue shimmer, micro holo glitters, and holo glow flakes. This is my perfect winter shade and may just be my favorite of the collection! Shown is two coats plus top coat. Pour Decisions is a deep burgundy with sparks that shift red to copper, with holo glow flakes. This one is fighting with Up To Snow Good for my favorite pick. It's so rich and complex! Shown is two coats plus top coat. The Holo-Day Collection 2017 is available now. 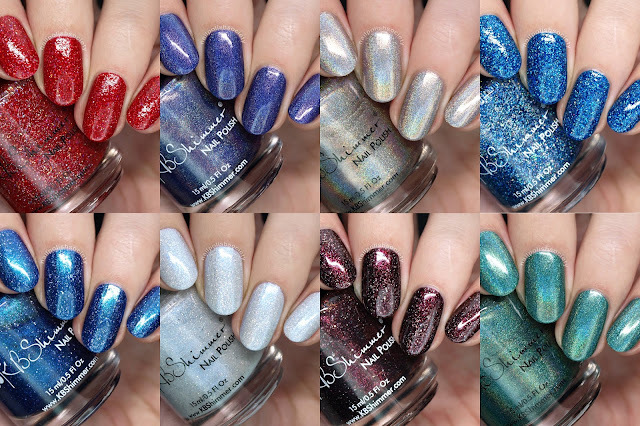 Each shade retails for $9.25 and can be purchased through the KBShimmer website, Harlow & Co., Color4Nails, and Amazon. Do you have any of these shades yet? Which are your favorite? It's great to be back and I'll see you soon!